Some of our favorite eggs from the Milwaukee Makerspace Grand Opening last weekend… There’s a “Milwaukee Monkeyspace” egg, and even a VEGAN egg! 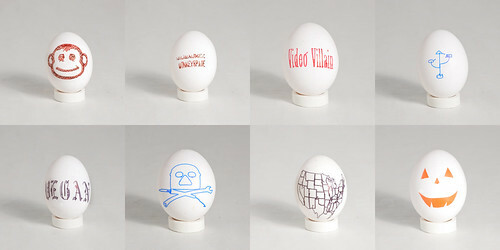 We gave away a lot of good ones, like the Rebel Alliance egg, but I’m sure we’ll be printing more very soon. Posted on Saturday, April 16th, 2011 at 12:45 pm. Subscribe to the comments feed. Both comments and pings are currently closed. Post on your own blog.